Important information will appear in this section as you complete each of the steps. Weighs 13 to 21 grams. 13 to 18 grams at birth. Sleeps the majority of the time but becomes squirmy when touched. Development stage is comparable to a preemie or newborn human baby. Weighs 13 to 21 grams. 22 to 35 grams at birth. Development stage is comparable to a three month old human baby. Top of tail is furred at 3 weeks. Eyes sealed or beginning to open; has "sleepy eye" appearance at beginning of 4 weeks. Lower teeth begin to emerge at 3 weeks. Wobbly/shaky when crawling inside of nest. Development stage is comparable to an eight month old human baby. Upper teeth begin to emerge at 4 weeks. Wobbly/shaky when exploring inside of nest. Both top and bottom of tail is furred at 6 weeks. Fairly active. In the wild, it would begin peeking out of its nest and possibly exploring within a foot or two away from the nest. Development stage is comparable to human toddler. Bottom of tail is furred at 6 weeks. Begins transition from indoor to outdoor cage with nestbox. Extremely active. In the wild they are coming out of the nest regularly under their mother's supervision (fieldtrips). At this stage their mother is teaching them how to forage for food and identify predators. Development stage is comparable to 5 year old human child. Extremely active. Regularly exploring outside of their nest, either alone or under their mother's supervision (fieldtrips). Development stage is comparable to a teenage human. 325 grams or more in weight (will acheive adult weight at 8 months). Completely independent of mother but may remain at or near nesting site. Practices nest building skills. Development stage is comparable to a young adult human. Based on your selection, this mammal appears healthy and may be a candidate for renesting and/or reuniting with its mother, based on your responses to additional questions. Wildlife have a far better chance of survival when raised by their own species. 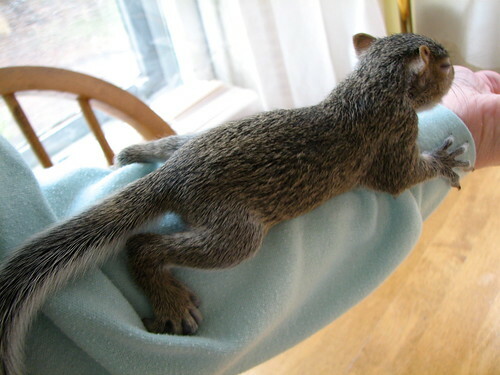 This mammal has been separated from its mother for too long and should be evaluated by a wildlife rehabilitator, who can determine whether the squirrel is healthy enough to attempt to reunite it, or whether it should remain in care. Click here to view advice on reuniting this mammal with its mother. Squirrels typically nest in cavities such as nestboxes, trees, and inside attics or sheds. And they usually have one or two other "backup" nesting locations. If the mother squirrel discovers that the nesting site was disturbed, she will relocate her babies to one of her alternate nesting locations. Squirrels typically nest in cavities such as nestboxes, trees, and inside attics or sheds. If a baby has fallen from its nest and is otherwise healthy, there is a very strong likelihood that its mother will return it to its nest when she comes back to nurse her babies. Squirrels typically nest in cavities such as nestboxes, trees, and inside attics or sheds. And they usually have one or two other "backup" nesting locations. If the mother squirrel discovers that the nesting site was disturbed, she will relocate her babies to one of her alternate nesting locations as soon as she feels it is safe. If you have found an orphaned baby squirrel, you can use this form to determine whether you should take it to a wildlife rehabilitator for continued care or attempt to reunite it with its mother. Additional information for each question can be viewed by hovering over the blue information icon located next to the question. Please contact a wildlife rehabilitator if you should have any additional questions or need further assistance. As with all wild animals, please use caution when handling young wildlife. Wildlife don't understand that you are trying to help them, and even babies can bite. Click on image to select. Development stage is comparable to a one month old human baby. Is the baby cold to the touch? Very young mammals are not able to generate their own body heat. Without supplemental heat, they can become lethargic. Do you see any bruising around the face or abdomen? Bruising is easier to see in very young mammals and is a sign that the baby has been injured, possibly from falling or trauma from a predator. Have you been caring for this baby for a few days and it has just starting becoming lethargic? If you have been caring for this baby and it recently stopped being active or wanting to eat, it is usually a sign that it has not received enough of the proper nutrition and/or it accidentally got fluid in its lungs while nursing and now has pneumonia. Both situations are extremely common when wildlife are raised by untrained individuals and can quickly become fatal unless the mammal is taken to a wildlife professional. Does this baby's abdomen seem sunken in? Most very young mammals look like they have little "pot bellies". Like human babies, they should look "pudgy", not skinny. If they have been recently fed, you can even see milk in their stomachs. An extremely skinny baby usually means it has missed several feedings. It should be evaluated by a wildlife professional, who will probably need to treat it for both emaciation as well as dehydration. possible broken bones, heavy labored breathing, etc? Any sign of possible injury needs to be addressed by a wildlife rehabilitator. Even a tiny puncture wound could be the sign of even worse internal injuries. Does the mammal appear "sleepy" or lethargic? Is the mammal inactive, keeps its eyes closed most of the time, prefers to sleep, or is uninterested in it's surroundings? Tiny babies should squirm around when touched. Older mammals should be bright, active and responsive at all times. Acting sleepy or lethargic is a sign that something could be wrong. Were flies or ants on or around this mammal? Flies are drawn to lethargic mammals and will lay eggs on a mammal's fur or open wounds. These eggs are tiny, white and oblong in shape and must be removed to prevent damage. Ants can also cause skin damage due to bites. Flies and ants are usually an indicator that the mammal needs to be evaluated by a wildlife professional. Are there dead siblings/parents nearby? If there are dead siblings or parents nearby, this usually means that this mammal is an orphan. Was this mammal handled by a dog, cat, or other predator? When small mammals are handled by a dog, cat or other predator, you might see some external injuries. But there is a high probability that there are internal injuries that you can't see. Also, any mammal that was touched by a cat MUST receive antibiotic treatment, even if you do not see any puncture or tear wounds. Young squirrels that have become separated from their mothers for a long period of time can become desperate enough to approach humans in search of food. These young squirrels are usually still nursing. Their lack of fear is an indication that they have become orphaned and need to be taken to a wildlife rehabilitator for continued care. It is a little more difficult to reunite a young squirrel that has been separated from their mother for too long. The young squirrel is usually still nursing, but has also now missed several meals. 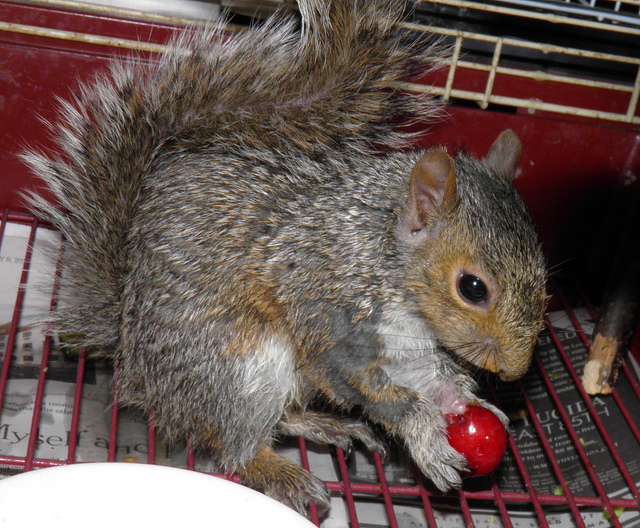 It should be evaluated by a wildlife rehabilitator, who can determine whether the squirrel is healthy enough to attempt to reunite it, or whether it should remain in care. Select this option to advance to the next set of guided questions. If a baby has fallen from its nest and is otherwise healthy, there is a very strong likelihood that its mother will return it to its nest when she comes back to nurse her babies. Squirrels typically nest in cavities such as nestboxes, trees, and inside attics or sheds. If a young squirrel is not found near any of these areas, it will be difficult to attempt to reunite it with its mother. How do I reunite a squirrel baby with its mom? We've included some videos below demonstrating all the different options used to reunite squirrels. There are a couple of important things that were done in each attempt. 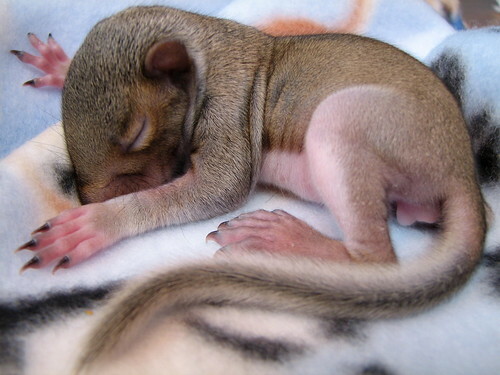 Visit our Reuniting Baby Squirrels With Mom page for full details. 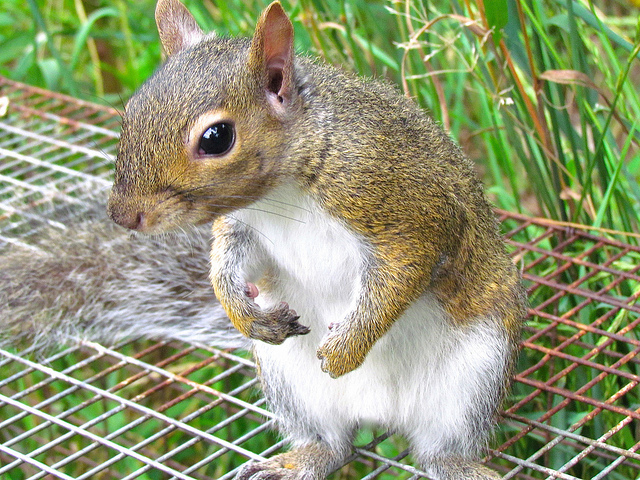 Your intuition is probably right, and you should have the squirrel evaluated by a wildlife rehabilitator just to confirm whether the squirrel is healthy or not. 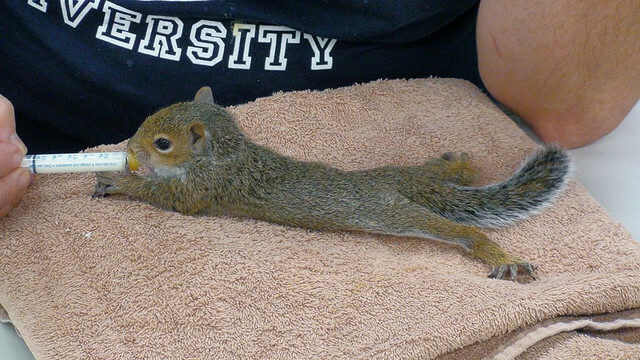 Wouldn't it just be easier to take this squirrel to a rehabilitator than try to reunite it with its mother? For you, perhaps; but a young healthy squirrel will have a much higher chance of surviving long term if it is reunited with and raised by its own mother. And not for the rehabilitator, who will likely be trying to care for dozens of other babies that truly need and would otherwise die, without their care and expertise. A small, young squirrel is climbing around on a tree. How do I determine if it needs assistance or is orphaned? 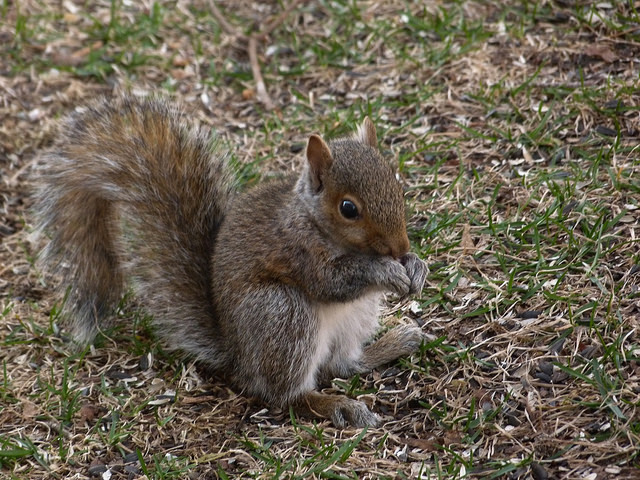 Use the photos and descriptions at the top of this page to determine the age of the squirrel. 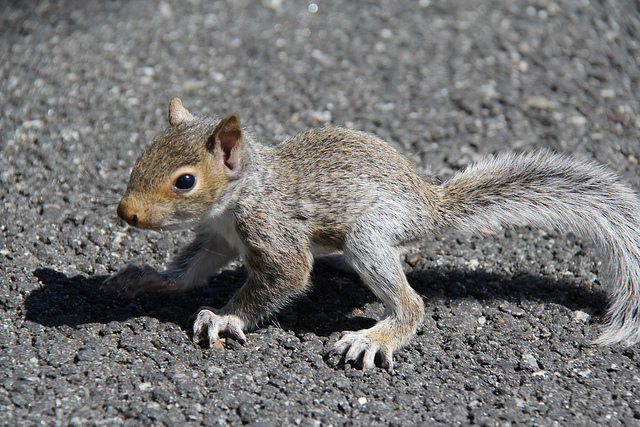 Between 6 and 7 weeks of age, young squirrels will begin to explore a little but still stay close to their nest. If you approach the squirrel and it is 6 or more weeks old, it should instinctively avoid you and crawl back up to the safety of its nest. If it is easily approached, seems lethargic, stays in one place, you hear it repeatedly call out for its mother, or it is younger than 6 weeks old, it may need assistance.